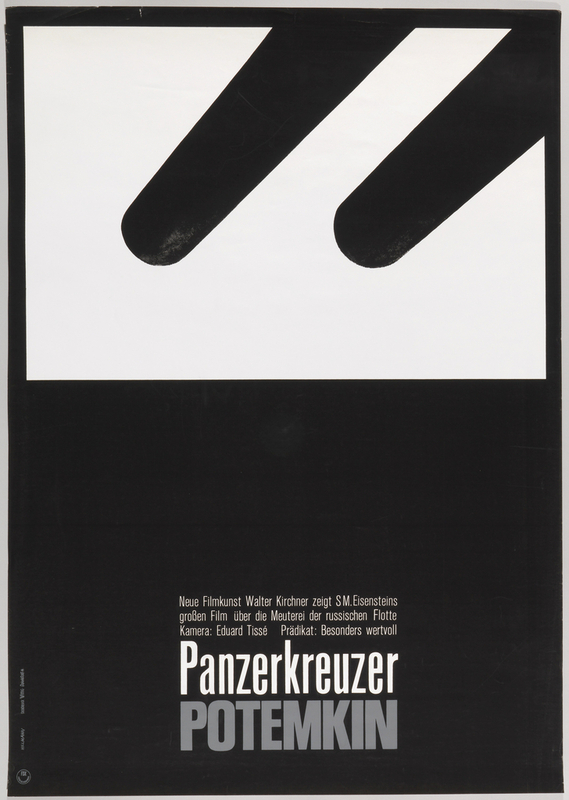 It is fascinating to compare the visual concept behind Hans Hillmann’s poster Panzerkreuzer Potemkin (Battleship Potemkin) for the 1966 German rerelease of Sergei Eisenstein’s 1925 film with that of Stanislaw Zamecznik’s for the same film dating a year later in Poland. It is hard to imagine a more minimalist design than Hans Hillmann’s striking composition. One white rectangle floats on a black ground. Only two black tubular shapes dangle down from the upper right to the lower left above a rectangular gray and white text box in the lower center. This stark image is threatening even if you have no knowledge of the film’s plot, but once knowing the story of the mutiny on the Potemkin and the slaughter of sailors and their revolutionary supporters on shore, one recognizes the black forms as canons shooting overboard from the battleship at the Russian authorities called to suppress the rebellion in Odessa on June 14, 1905. Poster, Pancernik Potiomkin [Battleship Potemkin], 1967. Designed by Stanislaw Zamecznik. Offset lithograph. 78.2 × 56.4 cm (30 13/16 × 22 3/16 in.). Gift of Sara and Marc Benda, 2010-21-27. Stanizlaw Zamecznik’s poster for the Polish release is disturbing in a different way. It actually shows the conflict taking place against the background of stairs, with police on horseback and the revolutionaries running down the wide stairway. The solarized image makes the figures seem already obliterated in the conflict. The red vertical bar at the upper left is echoed by the blood spilled below. Both pieces are among 158 posters given to Cooper Hewitt by Sara and Marc Benda of the Friedman Benda Gallery in 2009-2010. In an interview about his poster collecting rationale, Marc Benda said that he began collecting posters as a teenager, buying what appealed to him. He did not have a plan and had limited funds, but one purchase would invariably lead to the next. As he started acquiring objects, he noticed how a poster for the same film would be designed so differently from one country to the next. Gail S. Davidson recently retired as Curator and Head of Drawings, Prints & Graphic Design at Cooper Hewitt, Smithsonian Design Museum.